You may know and have experienced heartburn at some point in time or the other. You may think that it is just like a kind of upset. After eating oily foods, you may experience heartburn and just ignore the symptom as a simple occurrence thinking that it's just because of the food you ate. Belching or burping is just natural and quite commonplace. However, if it is often accompanied with heartburn symptoms, then it is no longer just a simple heartburn you think anymore. Our recent studies show that heartburn may lead to serious heart diseases, sleeping troubles, asthma-related illnesses, and even cancer. Heartburn or Gastroesophageal Reflux Disease (GERD) is caused by the backward flow of gastric juice from the stomach going back to the esophagus that results to inflammation in the mucous membranes surrounding it. Normally, a gate between the esophagus and stomach, called the “cardia”, prevents the reflux of gastric juice. However, belching or burping may temporarily slacken the cardia, which causes the gastric acid in the esophagus to blow back, resulting to inflammation of the mucous membranes. Of course, it does not mean that all burps you experience are the cause or result of GERD. There are various antacids that you can buy in your local drugstores. However, many of them can cause side effects such as constipation, diarrhea, and headaches. 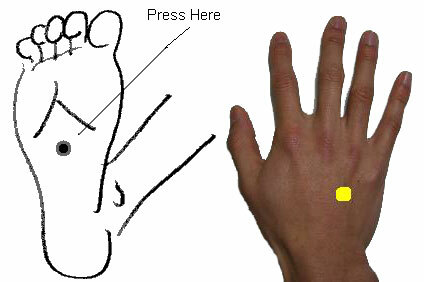 The illustration above shows a thousand-year-old Chinese traditional healing known as “shiatsu” or “finger acupressure” that may work as an immediate remedy. These methods are free and you can apply as many as you want and you can feel immediate results as a remedy. Yes, you have to give very strong pressure with your finger, or else you might experience no result. Probably 10 minutes per session, and as often as possible in a day. Remember that heartburn is the root of illnesses like cardiac pain, asthma, sleep disorders, throat discomfort, pulmonary fibrosis, or even cancer. Let us reduce stress at first. Applying the PYRO-ENERGEN therapy is one good idea for the above. 1. "New Type of Heartburn that is NOT Caused by Acid Reflux"